Deck and fence materials – especially softwoods and even some hardwoods – are often prone to a huge variety of garden pests. Although hardwoods can help protect against some lesser nuisances, simply using different materials on your fence and deck might not deter one commonplace summer pest: the carpenter bee. What is a carpenter bee and why are they a problem? Carpenter bees are different from other species of bee in that they are more solitary and less social. While other bees may have large nests and colonies, and may even have multiple nests in close proximity to each other, carpenter bees create their own nest, lay eggs, and then stand guard. In order to create these nests, the bees dig into wood and lay their eggs within the network of tunnels they’ve created. What type of damage can a carpenter bee cause? Structural damage is the biggest problem with carpenter bees – these bees typically return to the same site over and over again to create their nests. So while the first nest may not cause any major issues, repeated nesting over time can lead to a fair amount of structural damage to the wood that the bees are colonizing. By creating tunnels that can compromise the structural stability of a wooden post, carpenter bees create another issue – their natural predators are woodpeckers. Once a carpenter bee has established a nest, woodpeckers may be attracted to the site and exacerbate the damage by continuing to attack the wooden structure. Empty carpenter bee nests can also make an easy home for carpenter ants or termites, which can cause significant additional damage. If unaddressed, this type of issue can quickly spiral out of control. In addition, by digging into the structural material of your deck or fence, the wood is left exposed to weather and moisture, which can create additional problems such as rot. Additional nuisances, such as unsightly stains and markings, can also double as an indication that your fence or deck is hosting a nest of carpenter bees. 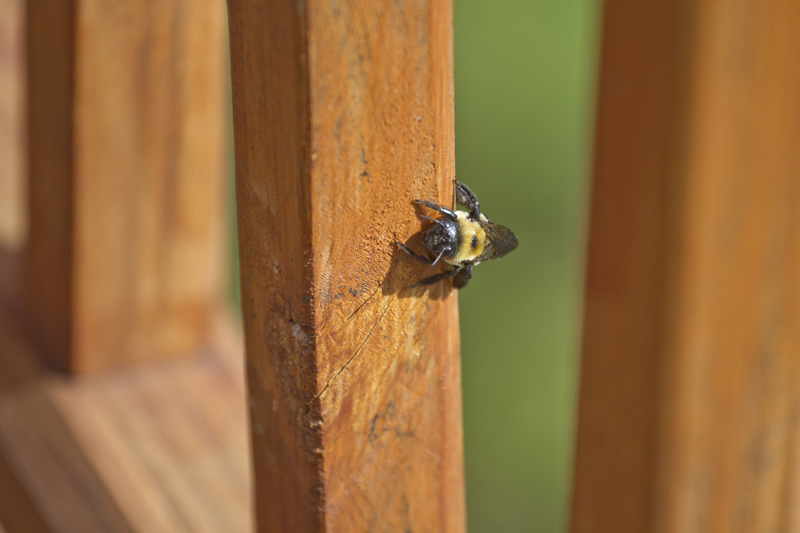 How can I prevent damage from carpenter bees? One major benefit to composite fence and decking materials is that, because of the large plastic/PVC content of the materials, they are less prone to invasive species that typically nest in wood and other dead plant material. Carpenter bees are also typically attracted to unfinished woods, cracks, and pre-existing holes. Coating your deck or fence in a weather-resistant layer of stain or varnish can help prevent infestations, and has the added benefit of protecting against weather damage. Stay aware. Make it a regular habit to check your fence and deck for damage. This is a good habit to be in anyway, and can help you stave off pests before they cause real harm. Treat active holes. Cautiously treating holes (nighttime works best, as bees are less active after dark) is the next big step to dealing with invasive pests. Using insecticidal sprays or dusts on the holes and interior tunnels will help destroy the nests – just make sure you don’t plug the hole too early, so that larvae have time to come into contact with the insecticide, or they may dig alternate exits and leave you with an infestation. You may have to treat multiple times before sealing the hole. Fill abandoned holes. Once a hole has been treated and you’re relatively sure that all of the bees are dead, use a wood caulk or putty to fill the holes to prevent recurrence and damage from environmental conditions. By taking the right precautions and treating infestations early, you can effectively protect your deck against many commonplace pests that can cause damage if left unattended. Prevention is the most effective tool a homeowner has at their disposal, so staying on top of possible issues is a great way to save money and protect your home. This entry was posted on Thursday, March 2nd, 2017	at 9:58 am	. Both comments and pings are currently closed.